Puja Fluid Seals Pvt. Ltd. is having full fledged manufacturing cababalities of manufacturing fluid sealing rubber products apart from rubber moulded and extruded articles. the unit is dedicated as a supplier to leading industrial and automobile giants. 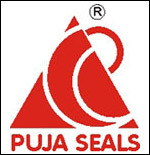 E-mail : sales@pujaseals.com. The company is ISO 9001-2008 certified. We want to be India's one of the best manufacture and supplier of Rubber and Plastic Components using Total Quality Commitment to provide the skills to support profitable customer relationship. We shall achieve this goal with Customer Satisfaction through Continual Improvement in all areas of operations with Quality, Productivity and Timely Delivery.